Media outlets around the region are trumpeting Weyerhaeuser’s plan to transfer its headquarters from its 430-acre Federal Way campus to what is now a parking lot adjacent to Occidental Park in Pioneer Square. The move may be wise from a financial aspect but the forest industry giant should be cautious because their chosen location is not the best building site. When the first settlers arrived in Seattle in 1851, the proposed building site was a tidal marsh, covering about eight acres. It was situated just behind a mound of land, where the first houses were built. 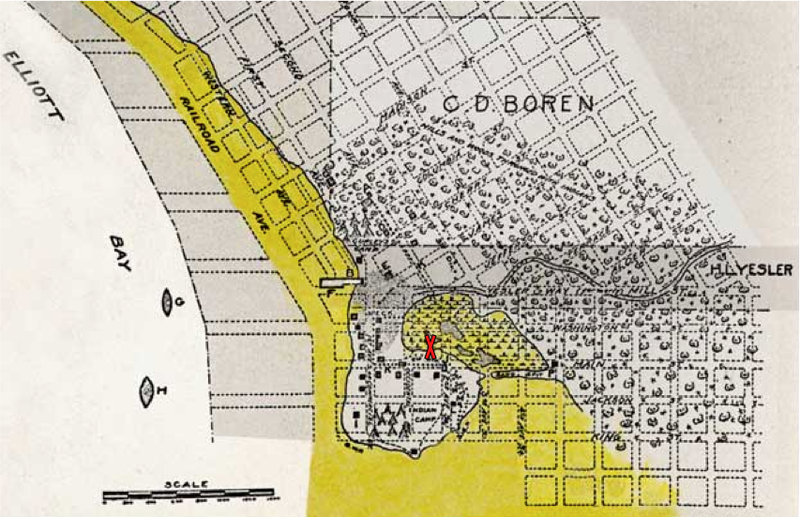 You can see the marsh in this early Seattle map, modified from Paul Dorpat’s web site. The building site is at the red X. The marsh was one of the first areas altered in Seattle by the settlers. Legend holds that one infamous land reshaper was “Dutch Ned,” who either wheelbarrowed or toted on his back sawdust from Henry Yesler’s mill and dumped the material into potholes and other less than solid spots. As you might imagine, sawdust isn’t the best subsurface to base one’s foundation upon. It has a tendency to rot and decay, creating voids and soft spots. One of the best places to see this is to go to the parking lot where Weyerhaeuser plans to build. Look at the cars. They are not exactly what one would call parked on level terrain. In some places, they are at relatively steep angles, at least relative to what one might expect in a parking lot. Another way to see what lies beneath is core samples. It’s not a pretty site down below. “Zones of sawdust and wood chips.” “Brick, mortar, asphalt, cinders, concrete, wood and charcoal debris.” “Very loose to loose WOOD debris; creosote/petroleum odor.” Basically, what one finds is the detritus of bygone history: the remnants of the Great Fire of 1889, Dutch Ned’s dumpings, and perhaps collections of garbage from early residents and industries. 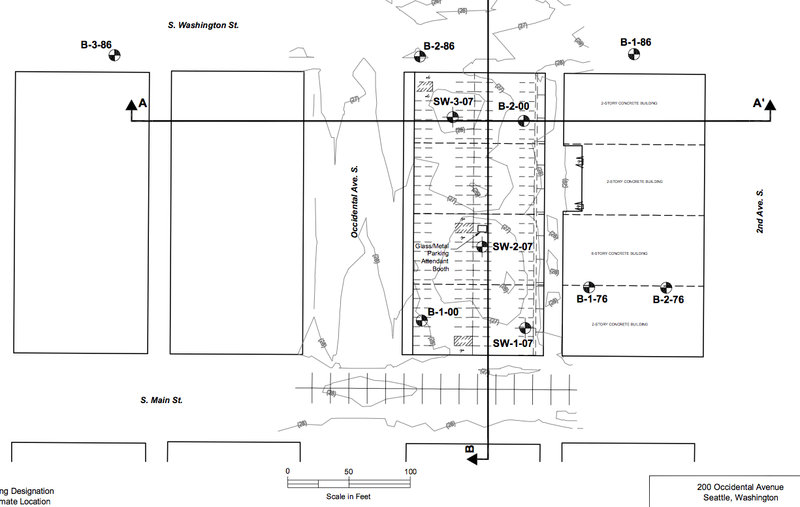 Of course, none of this means that the new Weyerhaeuser headquarters won’t be a solid, well built structure. I am sure they are aware of what they are getting into, or onto. 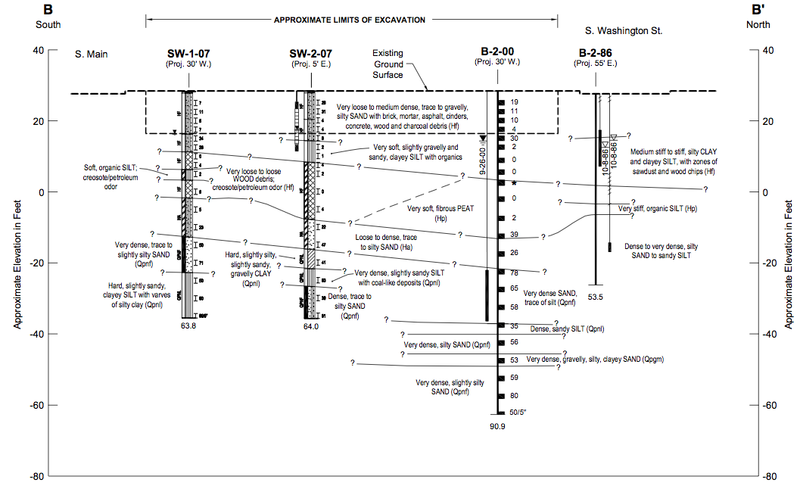 But these cores and early maps do give one pause to consider Weyerhaeuser’s decision to move. I can only hope that if and when the building is built that Weyerhaeuser does some good archaeology on the spot. Who knows what new stories they will unearth?